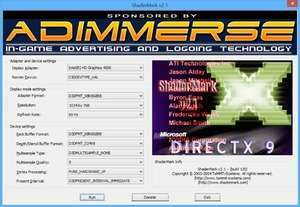 ShaderMark is a DirectX 9.0 pixel shader benchmark. All pixel and vertex shader code is written in Microsoft’s High Level Shading Language. ShaderMark provides the possibility to use different compiler targets and advanced options. Version 2.1.130a is a freeware program which does not have restrictions and it's free so it doesn't cost anything. For security reasons, you should also check out the ShaderMark download at LO4D.com which includes virus and malware tests. Additional screenshots of this application download may be available, too.